I don’t like beets. There’s nothing inherently wrong with them. They are, in fact, admirably true to their essential selves and remain stubbornly beetlike no matter how you cook them. This is great if you like beets, and disappointing if you are less than enthused by them. I keep wanting to like beets. I feel like I should like beets. When you read about beets they always sound enticing – earthy , soft, buttery, colorful, deep intense flavor. Doesn’t that sound like a vegetable you want to run out and try? And yet, upon cooking they remain unappealingly beetlike. However, last year we were out in San Diego and I had two revelations. The first being the discovery that San Diego is an awesome city and I may have to rethink my policy on never living in California. On the one hand I hold a deeply rooted East Coast suspicion about Californians, and on the other hand, the city was gorgeous and they eat outside. I really miss outdoor cafes. The second revelation was beets with goat cheese. We stopped for dinner at a disconcertingly trendy bar/restaurant and my roommate, having only recently been introduced to beets and still in the first flush of romance, ordered a beet salad to go with her dinner. This was my moment of epiphany. 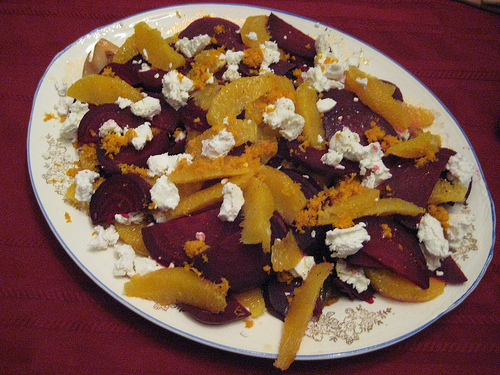 The beets are still beetlike, but contrasted with the creaminess of goat cheese and the tang of oranges that’s actually a good thing. I feel like I finally get what everyone is talking about when they wax rhapsodic about beets. I’ve been trying to recreate that salad since we got home, and my roommate cheerfully encourages my experiments. This isn’t quite it, it’s still a work in progress, but it’s very close and very good. Boil beets until tender (about 20-40 minutes depending on the size of your beets). While the beets are cooking, cut the onion into eight wedges, and separate the layers. Sauté in olive oil until caramelized. Zest an orange, and then slice the pith away from the rest of the orange. Then cut out the segments of the orange (probably over a bowl since this is juicy work) and reserve. Squeeze what’s left of the orange to get the juice. Add about as much vinegar as orange juice and then season with salt and pepper. Whisk in enough olive oil to make a light dressing. When the beets are tender, remove them from the water and allow to drain for a minute. While they are still hot remove the skins and slice. I find the easiest way to remove the skins is to rub them with a paper towel. Spread your cooked onions on a platter, and then arrange the beets and orange segments decoratively on top. Sprinkle the orange zest over the salad, and then crumble the goat cheese evenly over it. Drizzle the salad with the dressing (you probably won’t need all of it, you only want a drizzle not a deluge). Serve warm. Be warned! Beets stain everything. They will stain your hands, your cutting board, your counter . . . . there’s a reason that beets are used as an industrial dye. If you are particularly fastidious you can handle the cooked beets with disposable gloves, but I find that after I’ve washed my hands several times the beet stain wears off. I only started making these recently because I had convinced myself that they were terribly complicated and only the kind of thing that you made if you were a professional chef or Martha Stewart. I only discovered how amazingly untrue this is when I girded my (metaphorical) loins and looked up a recipe in the Joy of Cooking. Preheat oven to 450. Your oven needs to be hot when you put the popovers in, or they won’t pop. 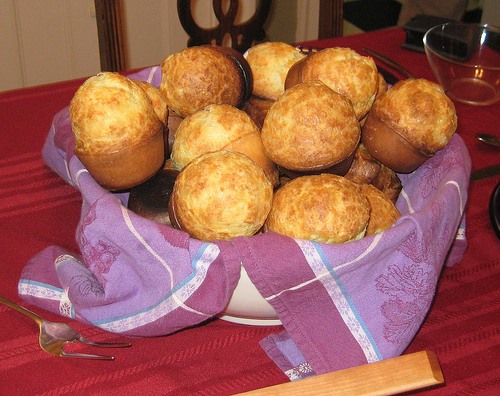 Lightly butter and flour 8 muffin tins (or popover tins if you have them). Whisk together the flour and the salt. Mix together the butter and the milk and then whisk into the flour. It’ll look a little like goopy glue at this point. One at a time, whisk in the eggs. Beat until no lumps remain and mixture has the consistency of heavy cream (add a little milk if you need to, although I never have). Pour batter into muffin tins, filling each about 2/3 full. Bake for 15 minutes at 450. 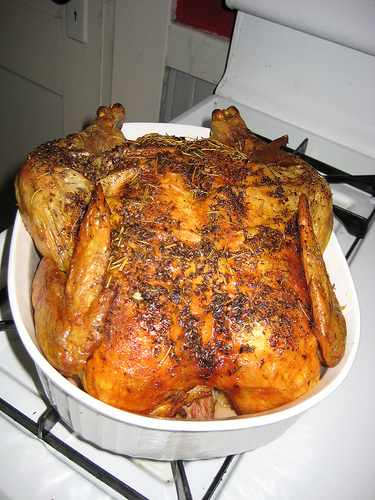 Without opening the oven turn the heat down to 350 and cook for another 20 minutes. You can cut a slit in the top of each one before you serve it to keep them from deflating, but they never last long enough in my house for this to be a concern. Don’t cover them like you would hot biscuit, they get a little soggy if they’re trapped in their own steam. The beet salad is absolutely delicious-a wonderful combination of flavours. That will become a regular feature of our diet. The tip about rubbing off the skins of the beets with paper towels is useful. I tried skinning one with a knife first, but the paper towel method works much better.